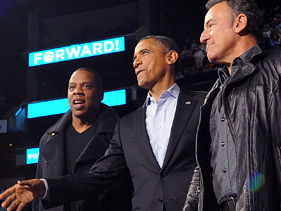 Jigga joined Bruce Springsteen in support of President Barack Obama at Ohio campaigning event before Election Day. With Election Day less than 24 hours away and so much focus put on the ever-important swing states, Bruce Springsteen, Jay-Z and President Barack Obama hit Columbus, Ohio, on Monday (November 5) to ask who’s gonna run this town in the final day of campaigning. “I got a phone call like, ‘Jay, I need you to meet me down in Ohio, man. Yeah, I need you to meet me and the Boss,’ ” Jay detailed Obama’s request to the crowd and those viewing via the live stream — in his best Barack impression, of course. 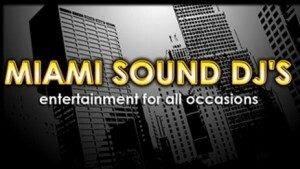 Hov rocked a number of songs like “Run This Town,” “Public Service Announcement” and a remix to his hit single “99 Problems.” “If you’re havin’ world problems, I feel bad for you son/ I got 99 problems, but Mitt ain’t one,” the music mogul rapped as the democrat crowd laughed in approval. Jay ended with his usual, the 2003 swan song “Encore,” but he performed his The Black Album favorite with a twist. Instead of inciting the expected “Hova” chant, Jay encouraged the crowd to sing “four more years” in support of Obama. After a bit of comedy, it was down to business as the president campaigned, speaking on healthcare, the economy and the overall future of America.